A major new feature in the Series 4 models, the electrocardiogram (ECG) was touted at Apple's September event as being the first time a device has been made available over the counter to consumers. 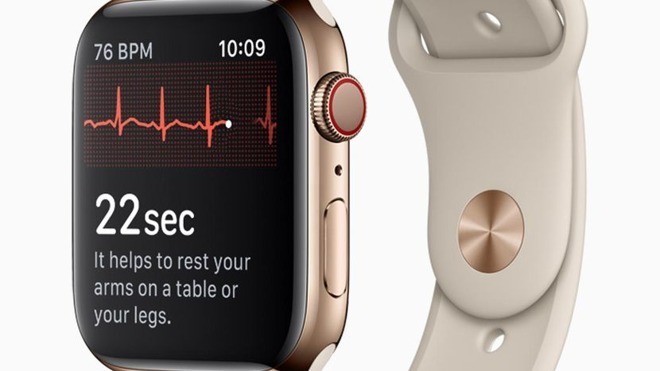 While the Apple Watch Series 4 shipped, the ECG function was notably absent at the time of release on September 21, but would be enabled at a later time by a software update. While the current version of watchOS 5.1.1 does not currently include support for ECG, the in-beta watchOS 5.1.2 version may be the release that enables the functionality to users in the United States. Internal training documents used in stores are claimed to state watchOS 5.1.2 will be required on the Apple Watch Series 4 in order to work. As the data is collected in the Health app on the iPhone, users are also required to update to iOS 12.1.1, another operating system currently undergoing beta testing. The training document advises the ECG app for the Apple Watch is regulated and only available to use in the United States. Apple gained U.S. Food and Drug Administration approval less than 24 hours before the Series 4's on-stage reveal. AppleInsider verified the existence of the document cited in the report by MacRumors, but could not confirm the contents, or which watchOS version was listed as containing the feature. Store employees are also instructed to tell consumers the ECG app "is not intended to be a diagnostic device or to replace traditional methods of diagnosis." The app should also not be used to "monitor or track disease state or change medication" without first speaking to a doctor. It is unclear exactly when watchOS 5.1.2 will be released for public use, as it is entirely possible that it could be pulled beforehand. Currently watchOS 5.1.2 is on its second developer beta in the testing cycle while others are on their third iteration, and with the relatively few additions made in each update, may indicate a public release could happen very soon.